As the climate crisis grows ever more urgent, Trump signed two executive orders today that expedite oil and gas pipelines and undermine states’ rights to protect themselves from the assault of the fossil fuel industry. This was yet another reminder that our government is run by a nihilistic sociopath who serves the whims of an industry that has killed people for profit throughout its history. This latest rush toward apocalypse will undoubtedly be met with complicity from the Republican politicians who have spent years pretending to care about states’ rights, and with ineffectual faux-outrage from Democratic politicians who have rarely ever used the powers available to them to stop fossil fuel expansion. Thankfully there is a growing movement of people willing to engage in civil disobedience to stop fossil fuel infrastructure everywhere in this country. The Climate Disobedience Center is proud to be part of that movement which has effectively made all new pipelines losing investments, and we will continue fighting every one of these stupid projects until we have the organized power to overthrow our system of corporate rule and establish a democracy that respects life. Monday morning, February 4, four climate activists in Blackberry Township, Minnesota closed safety valves on a crude oil pipeline belonging to the Canadian energy corporation Enbridge. This is an escalation of ongoing activism aimed at Enbridge, which is facing stiff resistance to their plan to build a new high capacity crude oil pipeline, Line 3, through Minnesota and across multiple Native American reservations. It is also the second time in just over two years that activists have shut down Enbridge pipelines, citing the urgency of climate change as justifying their actions. Cortlandt, New York - Today, Cortlandt Town Justice Kimberly Ragazzo found three New Yorkers -- Rebecca Berlin, David Publow, and Janet González -- guilty of trespass, rejecting the climate necessity defense; the three shut down construction of the Spectra Energy (now Enbridge) high-pressure, high-volume, fracked-gas, “Algonquin” Incremental Market (AIM) pipeline. Justice Ragazzo highlighted the strict, objective standard of New York’s necessity defense and focused her verdict on the narrow grounds that the defendants had not exhausted all legal remedies, specifically citing the defendants failure to file as ‘intervenors’ with the Federal Energy Regulatory Commission (FERC). Today, we are excited to get to tell you about a project we've been working on over the past year - one that we hope could be a major new force in the climate justice movement. This week three of us are headed to California for the first 'on-boarding' into a new national network of locally rooted cells, working at the intersection of direct action on climate change and racial reparations and atonement. At the core this network of groups, which is still emerging (and thus hasn't been named yet), is the belief that while there are many paths to make the strides needed in climate action and in reparations, and we are called to orient in a particular way. We know that we want to lead with a fierce vulnerability; being firm in the truth and leading with our hearts on our sleeve. We know that lifting up the gifts and the vocation of each person in the network will make us more powerful than trying to fill slots with foot soldiers. And we trust in the wisdom of emergent strategy, because the top-down, centralized organizations of the past can't muster the power and creativity needed in these times. We hold a vision of a holistic, integrated approach to nonviolence that goes beyond a tactic or a strategy to the core of our world view where the means we use are the ends in the making. 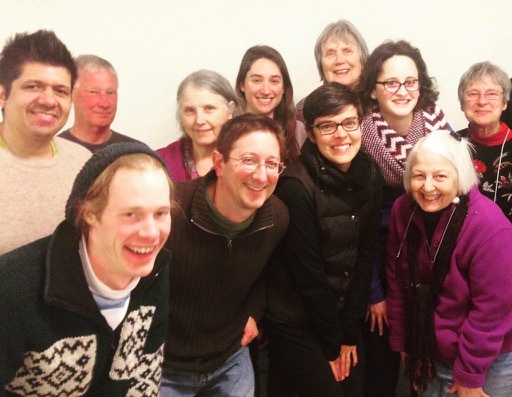 We have felt for a long time that something is missing in the climate movement ecosystem - a network of people for whom nonviolence and justice are more than just buzz-words, but are rooted deeply in an integrated approach at a spiritual level. And it is clear that an integrated approach where the means make the ends cannot simply advocate for a just transition, we need to be living and experimenting with new honest approaches of reparations right now. None of this can wait. This year, the Climate Disobedience Center has launched a new experiment - and invites you to join us. Collectively, we have come to understand the need for morally imaginative, strategic, and decisive climate disobedience. Yet, within our own selves and our work as climate activists - we also hear the call for deep connection, community, and love. That is why we are convening praxis groups - to more fully sink into the relationships, learning, and trust required to move into climate action. Does this sound like you? Please read our full invitation here and then fill out the application. We'll be in touch soon! The primary lesson reinforced by the Minnesota Valve Turners Trial is that with climate necessity defense trials, and other political trials, you never know what you’re going to get, and you have to be ready for anything. I’ve attended quite a few trials that were almost necessity defense trials, or what we hoped could have been necessity defense trials, and there is always something standing in the way of the trial becoming what we wanted it to be. A week before the Minnesota trial, it seemed like it was the best hope yet to finally be a full necessity defense trial in front of a jury. The case had already been through two rounds of appeals, with the state superior court affirming that the defendants had the right to use the necessity defense. And this is important: those appeals court victories by the valve turners set a precedent in Minnesota that will help others use the necessity defense. This could be critical in the the line 3 pipeline battle that is now heating up. This threw a twist into the trial at the very earliest stages. The jury selection process is an opportunity to frame the narrative of the case for the jurors. The way questions are asked shapes the way people think about the issues. In a climate necessity defense case, the narrative should be about how we respond to very real and serious threats. But lead attorney Lauren Regan was put into a difficult position by the last minute restrictions on climate science testimony, so she made an unusual gamble. Bringing together Kazu Haga, Michelle Fournier and the Climate Disobedience Center's Marla Marcum and Tim DeChristopher. I’m writing today to make sure you’ve heard the news about a necessity defense climate trial in Cortlandt, New York where six defendants have been granted a necessity defense by Judge Kimberly Ragazzo. Although the Westchester District Attorney’s office reduced charges to a level that denies these pipeline fighters a jury trial, their case is moving forward in a bench trial (in which the judge makes the ruling on guilt or innocence). I spent spent the last two and a half days in preparation and in court with the defendants and their supporters, and this necessity defense trial is unfolding in some fascinating and promising ways.